The time has come to finally design your dream engagement ring, the first order of business is to decide on what diamond shape you like. The shape you decide on has an impact on the overall look of the ring. Some shapes are more modern and dazzling whilst others focus on a more vintage look. 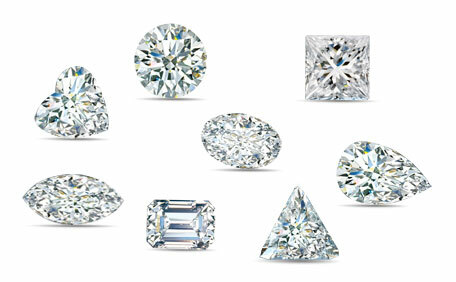 Choosing a diamond shape however is mainly based on your own personal style and preference. Out of all the different elements that come until play when choosing a diamond, you’re most likely to have the strangest feeling towards the shape. Before you buy a ring, it’s a good idea to check with the recipient if they have a favourite diamond shape. Other elements that contribute to the price include size, colour and clarity and can be tweaked later down the line. The shape of a stone is often referred to as its cut. In this case, it’s important to be sure it’s not confused with diamond cut which referred to the polish, symmetry and proportions of a stone. Diamond shapes can range all the way from the classic round which is so well known and loved, to be more modern shapes such as the fusion cut. Ultimately you’ll be the one wearing the ring so pick a shape that you like and you’ll be loving your ring for years to come! The Diamond Club can take all of your refurbishment needs, from smaller alterations and adjustments, all the way through to complete remodels. We offer a variety of options, such as redesigning your jewellery using the original stones, in a setting of your design, using either new gold or your own gold which you have provided and even adding in new stones into an original setting using either stones you’ve provided or stones carefully selected by Pierre. Please don’t hesitate to contact us for any more information regarding the redesigning or remodelling of old jewellery or to book in an appointment to discuss turning your jewellery into your dream piece. It is so important to keep your jewellery looking as beautiful as the day you received it and all it takes is a little care and attention. Generally the gentlest way of cleaning is to use a mild soap(no detergent), warm water and a very soft brush and drying with a soft cloth or towel. It is a good idea to store your jewellery in separate compartments or boxes. Some delicate gems can be affected by sunlight. Hairspray and perfume has a detrimental affect on pearls so always remember to spray these before putting your pearls on. Chlorine and products with bleach can effect certain alloys, especially those associated with white gold It is important to take special care of gems, especially emeralds with natural inclusions on the surface as these can chip or discolour. The birthstone for February is the Amethyst. Amethyst is the purple variety of the mineral quartz and is a popular gemstone available in different shapes and sizes, making it more affordable. Amethyst complements both warm and cool colours and therefore can be used with white, yellow and platinum jewellery. The name “Amethyst” comes from the from the Greeks and means “not drunken or sober”. The ancient Greeks and Romans believed Amethyst would ward of the intoxicating powers of alcohol and keep the wearer clear headed and quick-witted. Purple Amethyst speaks of peace, temperance, serenity and royalty. What better way to celebrate a birthday than with a birthstone, usually in the form of a jewellery piece. Why every month was assigned a specific stone is still unclear but it was believed that people started to wear a different gem stones each month as a sort of talisman, believing each stone held certain powers and gradually specific gemstones became attached to specific months. In 1912 a birthstone list was created for commercial use and it is now excepted all over the world. Some months have more than one stone and over the next weeks we will share with you some information on the birthstone assigned for every month of the year. You’ve done everything right so far and you are close to the perfect moment but there is still a few things to keep in mind. Although we are far removed in this century from paying a dowry or lobola as referred to in some African cultures. It is wise to still get her parents blessing, seeing that you are taking one of their priceless possessions as well as becoming part of the family. Pick a personal or favourite spot and make it meaningful. Use your creativity and make this experience a unique and memorable one rather than a cookie cutter proposal.